Harlequin Drive, Yowah via Cunnamulla South West Queensland. Google maps and RACQ maps will get you to Yowah. Yowah is an easy 2 hour drive from Cunnamulla, on a sealed road. 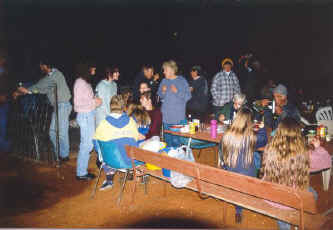 The Yowah Opal Miners Festival to promote the Australian National Gemstone, Opal. 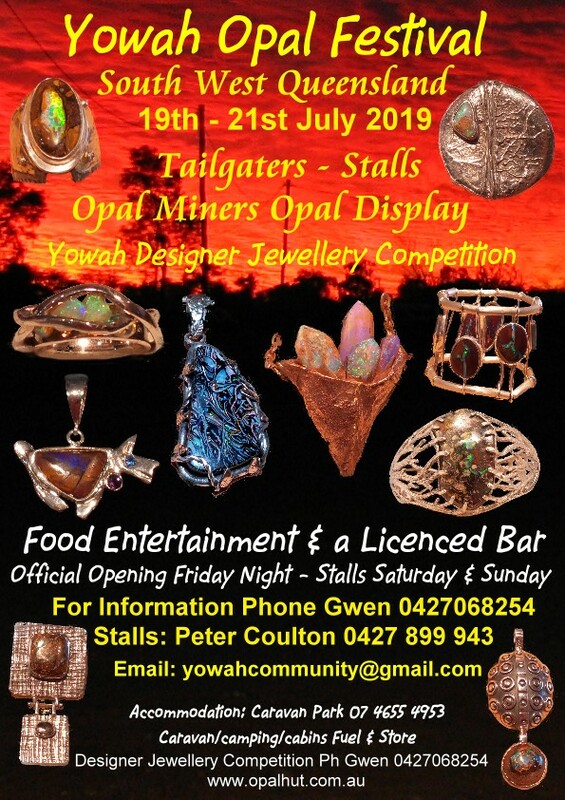 We the miners of Yowah invite you to the Yowah Opal Field to celebrate this weekend commencing on Friday night. Designers and Metalsmiths - Enter the Yowah Opal Festival Designer Jewellery Competition. It is a gem of a place this little four block town in Outback Queensland, and we celebrate our uniqueness with an annual festival - The Yowah Opal Festival. Yowah's opal celebration occurs on the third weekend of the month of July each year. Located two hours drive from Cunnamulla on a sealed road. World class museum specimens of Yowah Nut Opal, Ironstone Matrix Opal, Opalized Wood Opal, Yowah Boulder Opal and Boulder Opal are on display as the locals share their prize collections with all. The Yowah Opal festival is fully catered and licensed for the week -end. Morning and afternoon tea, and three meals a day are cooked on the premises. Fresh food is provided including pit roasts, bar-b-ques, and smorgasbord for a three day bit of variety, including breakfast all days and on Monday before guests hit the track. Music and dancing is part of the festivities. The townspeople encourage everyone to talk to a miner. Yowah is billed as the "friendly" opalfield and the people gather to prove to you why. The town of Yowah is named after the opal field it grew from, and the Yowah opal field got its name from a creek that runs through it. In the 1890's the Yowah opal centered nut was feverishly mined. Today both the Yowah gem nut and its cousin, the Yowah opal matrix nut are equally sought after by both a national and an overseas gem market.